Georgeé & Company creates a unique marketing plan for each listing to best position it at the forefront of local and international markets to attract the highest number of qualified buyers. Our team spends approximately 35 hours a week in targeted and proactive search for buyers to meet our sellers' objectives. An expansive range of print, direct mail, website and social media formats are utilized to maximize exposure to South Florida's top agents and motivated buyers. Your home is listed with as many photos as possible on the Realtors-exclusive listing service in Miami-Dade, Broward, and Monroe counties — no one presents your home better! Trained to cross-sell inventory so your home gets maximum exposure with an extensive network of Realtors. Customized e-vites are distributed to over 16,000 local real estate professionals and thousands of contacts from our database of prospective buyers. Our team of assistant listing managers is on-call to schedule and show your listing with responsive communications and follow-up. High-resolution and professionally lighted and processed imagery makes your property shine in online and printed materials. Details and photos of your home are featured on sites with exposure to millions of views each month, including REALTOR.com, KW.com, and the country's leading aggregate MLS-fed sites. Our agency site GeorgeeKluck.com and lead generation site TheBestMiamiHomes.com highlights each of our exclusive listings with careful consideration, including high-quality photos and thoughtfully written description, virtual tours, as well as property and community resource maps. Our Facebook, Twitter, and LinkedIn social media pages are also key outreach channels to highlight your listing, and include paid post boosts and feed ads. Brochures of your property are e-mailed to over 16,000 REALTORS® throughout Miami-Dade, giving agents a first look at new listings, alerting to price reductions, and inviting them to our open houses. Investing in paid search drives traffic to your listing. Social networking sites such as Facebook and Twitter help generate even more interest in your listing. We issue periodic reports that show viewing traffic for your listing. Your listing is also auto-listed on real estate sites such as Trulia and Zillow. The Georgeé & Company/Keller Williams brands are highly recognized and respected. When agents or customers call on our sign, they know they can expect the optimum in customer service. We are a Keller Williams certified Global Property Specialist with specialized skills and access to the Proxio Pro website to reach over 500,000 agents in more than 100 countries and the ability to translate your property in to 19 different languages. Our listings are featured on WorldProperties.com, the official website of The International Consortium of Real Estate Associations, with global reach to agents, investors, and buyers in 113 countries. Your home will be featured in our full-color, monthly home catalog that is mailed to over 7,000 homes within targeted bayside communities. Copies are inserted in all property information boxes and distributed to potential buyers. Georgeé & Company branded distinctive postcards featuring timely messages and our exclusive listings are occasionally mailed to specified neighborhoods. 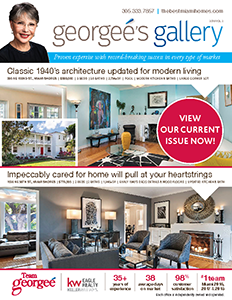 Monthly full-page ads highlight our exclusive listings and the Georgeé & Company brand and is distributed to 7,000 homes and businesses within Biscayne Park, El Portal, Miami Shores, and select northeastern Miami-Dade communities. Vist our office any weekday between 9-Noon, and you will find our team calling past clients, current clients, and fostering new relationships. We are continually and consistently searching for homes for our buyers and buyers for our listings. Successful partnerships with an extensive network of results-driven Realtors is one of our best resources for selling your listing. Our reputation as experts and ease of working with makes us a desired partner. Our goal is to cultivate clients for life. Many of our referrals are from satisfied buyers and sellers. Team members attend networking events and Georgeé & Company sponsor community events. Your listing is on the forefront of our minds. Our job is to make sure that everyone we meet in the community is aware of your property. Contact us today to list your home. It is our goal to provide each of the above services to all of our clients in order to sell their home in the most timely and successful manner. However, this may not always be possible or feasible due to elements beyond our control, such as market conditions, media availability, or time constraints. Therefore, not all of the marketing services outlined above may be used in the sale of a property.